K-pop boy band BTS ranked second among the top ten global recording artists of 2018, named by the International Federation of the Phonographic Industry, becoming the first Korean musicians to make it on the chart, the chart result showed Wednesday. 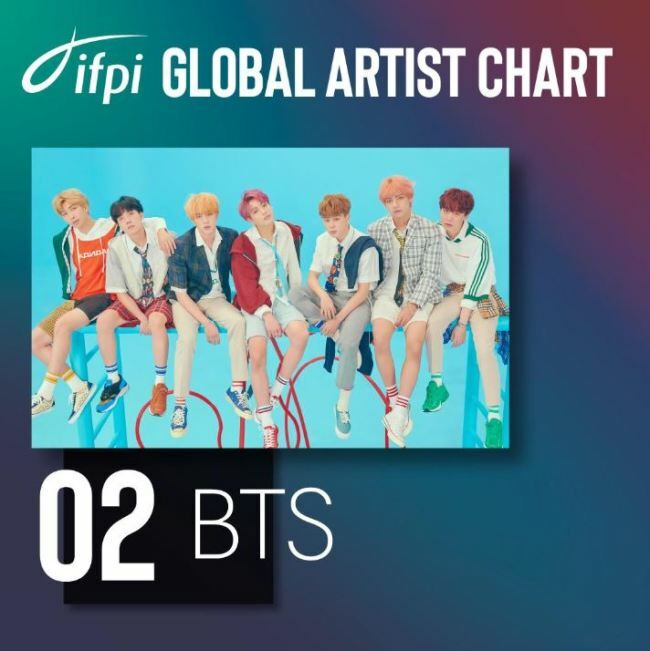 The Global Artist Chart of 2018 was uploaded on Tuesday (US time) on the official website of IFPI, the organization that represents the recorded music industry worldwide. Drake, a Canadian rapper, took No. 1, and BTS, coming in second, was the only non-English-language artists on the list. The third, fourth and fifth places went to Ed Sheeran, Post Malone and Eminem, respectively. "This year's Top 10 artists reflect the global appeal of music. From modern-day superstars like Drake, Ed Sheeran and Ariana Grande, to the rise of genres such as K-Pop, to legacy acts like Queen, fans are exploring and enjoying music of all types and from all corners of the world," IFPI said. "South Korean seven-piece boy band BTS take second place on IFPI's list after the massive global success of album 'Love Yourself: Tear,' released in May 2018, and 'Love Yourself: Answer,' released in August 2018," it said. "Since their formation in 2013, BTS have established a truly global fanbase - known as the ARMY - and have been instrumental in bringing K-Pop to a global stage," according to IFPI.